Steering wheel locks also known as crook locks, have been in use since the early 1920s when a lot of cars were open roofs and needed more protection. The most prominent brand in the market is Winner’s The Club (which is why steering wheel locks are also called Club locks). James E. Winner Jr. started the company after his return from the Korean War, where, fellow soldiers and he were ordered to secure their steering wheels with metal chains. Early wheel locks fastened one end to the wheel and the other to the brake or the clutch. However, modern clubs mostly hook onto just the steering wheel making them more visible to prowling car thieves. Let’s explore the ten best steering wheel locks out there and what makes them so good. The Club 1010T is a heavy-duty version of its predecessors. It firmly locks by simply extending it to the appropriate length. Yes, the key is not required to lock it, but you will need it to unlock the device. The Club 1010T takes it’s build to step higher than it’s predecessors. Weighing in at a solid 3.7lbs with a measurement of 4 x 9 x 6 inches. 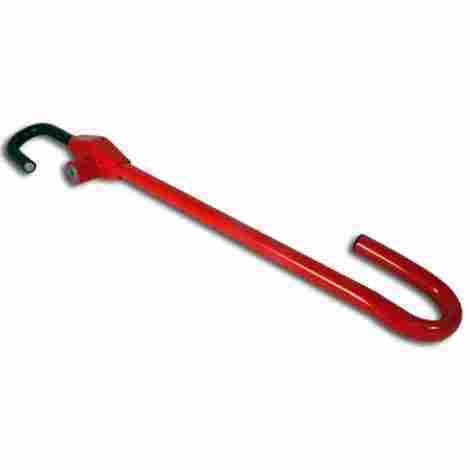 The device is built with steel hooks and a body of Cro-molly steel which is more resistant to hammering and sawing. It may not be completely immune to a hacksaw but it will take longer to break. With a thick body and sturdy rubberized clamps, most customers of this product love it purely because it serves as a visual deterrent for car thieves. Since it locks right onto the steering wheel, it’s plainly visible from the outside. A scouting car thief would pass over your car for the plain hassle of time and energy spent sawing through the Club 1010T secured on your steering wheel. The Club 1010T is a good find, because it’s a sturdy product that sells at an extremely affordable price. This is one of those Winner’s products that goes on sale occasionally, so, keep checking! Works on most passenger cars. Does not work on larger SUVs. Instances of rubber grip staining the steering wheel. While other devices use clamps to secure the wheel, or, a hook that clamps down on the brake pad, the DISKLOK security device encases your entire steering wheel in 11 pounds of hardened steel (8.8 lbs if you go for the smaller size). The company has two sizes for its locks, small size which is for steering sizes of 13.7 – 15.3 inches, and, a large size which is designed for 15.4 inches to 16.3 inches. All this with a three-year mechanical warranty from the company. If visual deterrent is what you’re looking for in a security device, then look no further. Encasing your entire steering wheel with hardened steel should deter most car thieves. The thickness of the metal also makes it hard to saw through. The lock is resistant to lock picking and can only be opened by three laser cut keys that come with the purchase. 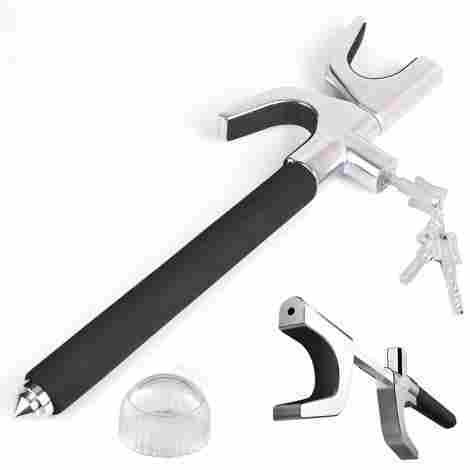 Also, the locking barrel has an anti-drilling and anti-picking design with a million possible combinations. The ten internal disks spin when picking is attempted leaving the lock impossible to open. This product has some cool, patented features built into it. One of these features is the ability for the Disklok to spin on the wheel. 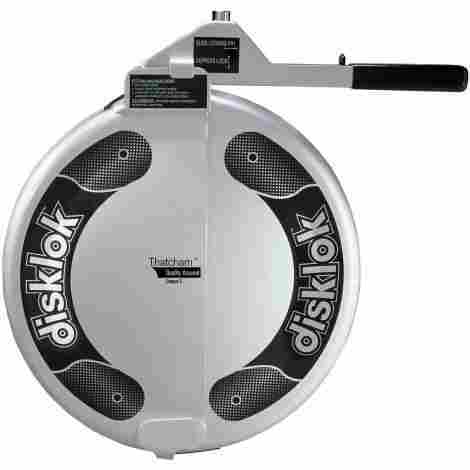 The Disklok does not attach to the wheel, it simply encases it. So, when attacked, it spins freely completely protecting it from use and preventing damage to your car’s in-built steering lock. Since the Disklok encases the entire wheel it also provides some airbag protection. Yes, compared to other products in this list, this product is priced on the higher side. However, with it, you do get the additional security. Besides being a great visual deterrent, the DISKLOK also protects the airbag, protects the steering wheel from being sawed and completely immobilizes the wheel from any other kind of attacks. Heavy (11 lbs for big size and 8.8lbs for small size). The Club is an established brand when it comes to these security devices. The company has been the market leader in this category consistently putting out new products and innovating. Any time a defect has been detected, or, one of their products has been bettered by a thief, the company goes to work and puts out a better product. The CL 303 is a standard model from The Club. It takes less than a minute to install and comes with two keys that go easily on your key chain. At a locking length of 22.5 to 30 inches, it works on almost every passenger car (including trucks and SUVs) and weighs an easy 2.55 lbs. Not only this, it also works on golf carts and boat propellers. A rubberized red hook goes on your wheel and a black clamp goes around your brake pad. This device is an ideal price for anyone who wants a little more security for their vehicle without emptying their wallets. Sure, car security is a valuable and, in a perfect world, you could get yourself an ace steering lock for a ton of money. Good news is that at the price it goes for, the CL303 will give you great service and value. The Club CL303 is one of Winners best sold products. That’s because it delivers solid value for its cost. Like mentioned before, people usually pick up one, two, or even three—two for the cars and one for the boat. If bar is under too much tension, it will not lock. A major upgrade from other Clubs, this is arguably the heaviest and most awkward option yet. However, it delivers in terms of protection and security. It comes with the Club’s patented self-lock feature as well as three laser encrypted keys that cannot be duplicated. Color wise, it comes in Navy Blue, but there’s also the Club 1103 LX which is pretty much the same but comes in red and Chrome. Most complaints about these types of products are the paint residue they leave behind on the car, or the smell of plastic left behind after they have spent a whole day in a hot car. The Club LX addresses that problem by encasing the bar with a clear plastic sheath getting rid of the smell and stickiness that plagues some steering locks. The Club LX may be heavy, but it comes with great instructions on how to operate the device as well as suggestions about the best positions. The maximum-security way is to place it behind the steering wheel with the lock facing you. The Club LX fits most passenger cars and will not scratch. The weight builds into the sturdiness and the build is more resistant to hacking, hammering, and even Freon. The Club LX is a popular product simply because it has a great cost to value ratio. If you’re looking for a heavy-duty lock but also want a lock that’s eye-catching, then the Club LX is the right choice for you. Does not scratch the wheel or stink up the car. The Club 900 is a simple product that is highly effective and comes at an extremely affordable price. It weighs slightly more than the CL303 at about 4lbs and locks onto just the steering wheel. It also comes with a key that is needed for both locking and unlocking. One of the primary motivations for Clubs is to be a visual deterrent and, usually, the presence of a Club deters most car thieves. The Club 900 builds on this by coming in a bright, canary-yellow color which is readily visible from outside the car from a distance, even at night. This is the device’s primary function and it’s something it clearly delivers on. While it is not as expensive as the LX or the 1010T, it still delivers a decent value for its price. The flexibility and adjustable length make it a good fit for most passenger cars while the bright color makes a statement about the car’s security even from a distance. Although it is more an 80’s product, it has remained relevant today because of it’s simple effectiveness. Good value for the money. An exceptional value for its price, the Club 900 is a great visual deterrent which can be picked up at a reasonable price. It also goes on sale from time to time, so keep an eye out and pick up two. Bright and visible from outside, even at night. Not as heavy duty as the Club LX or the Club 1010T. 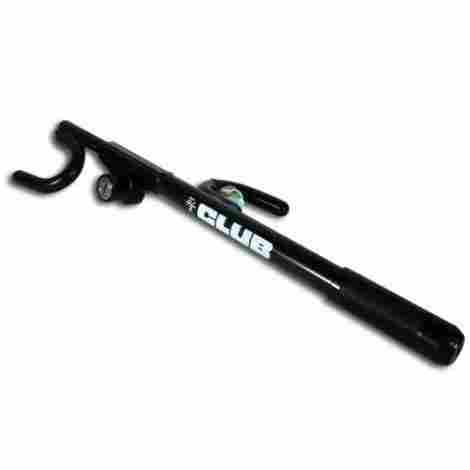 Winner’s the Club is almost a standard in the steering wheel lock market. Recently, however, some competition has been sprouting up around the industry giant. A notable one is the Monojoy device seen here which boasts functionality, multi-purpose use and functionality. Especially because it gets a high rating from mechanics, car enthusiasts and even the cops. This product features B+ grade lock cylinder which is pick-proof and resists sawing, prying, hammering and freon. It also comes with three laser cut keys that cannot be duplicated. The body is silver with a black grip and is a solid visual deterrent. In addition to this, the Monojoy also doubles as an emergency hammer that can easily crack a windshield incase you are ever trapped in your car. Built out of round steel and aluminum, the device weighs an easy 3.05 lbs and fits all passenger cars and most SUVs and trucks. The shaft has a range of 17.7 inches to 28.7 inches which will work for most autos, only the Club 2100 has a longer range. The flexibility of the device allows it to be used in multiple locking positions depending on your preference. Want a car security device? Also want an emergency hammer? This is the product for you. The price range is competitive with most Winner’s products in this list and has what made Monojoy such a competitor to Winner’s. Doubles as an emergency hammer. 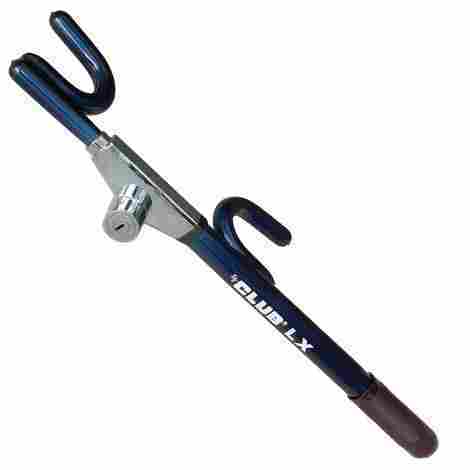 The Club from Winner is a popular product for more passenger autos. Although most Club locks work on trucks and SUVs, there was a demand for a product for larger trucks. This prompted the development of the Club 2100 geared specifically for larger passenger autos at the same price as the Club LX with all the standard features like the patented self-locking, sturdy build and keys that cannot be duplicated. 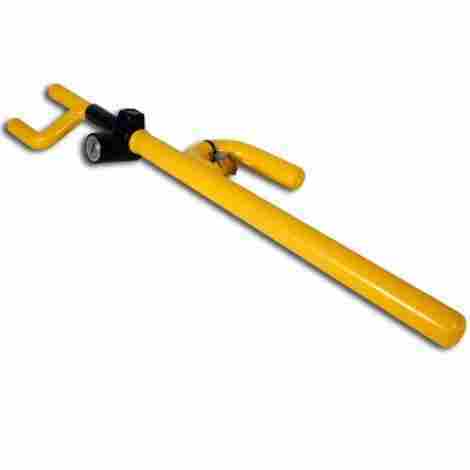 Large autos now have a steering lock built specifically for them. The Club 2100 weighs about 4.5 lbs and measures 5 x 9 x 4.8 inches. The body comes with a longer shaft that is what makes it great for SUVs. For example, the LX fits wheels up to 16 3/8 inches while the 2100 fits steering wheels of up-to 19.25 inches and has a 15 inch distance from the inner hook to the end. This will work effectively on almost all big autos. Most locks come with keys, but the Club 2100 (like the Club LX) comes with three laser encrypted leys that cannot be duplicated. In addition to this, the Club 2100 has a high-security locking system with a Quad style key that provides greater protection against lock picking. If you’re looking for a product that’s universal on most SUVs, then this is the one for you. Best part is that it comes at a good price. The good thing is that just because it says it’s an SUV lock does not mean it will hurt your wallet. Advanced key and locking system. Fits almost all large autos. Longer shaft than other Club steering locks. A relatively compact device weighing about 3 lbs and measures 5 x 5 x 5 inches. The name gives away the allure of this product. Yes, it is made from titanium material, is easy to install and features a quad lock design for added security. The one aspect in which the Master Lock 263 DAT surpasses other similar options is the strength of the product. Unlike other locks which are made of steel and aluminum the 263 DAT is made of titanium which makes it extremely resilient to even the most industrious car thieves. Hack sawing is the most common way that tools outsmart locks and the titanium build is a strong deterrent. When locked, the 263 DAT features a flashing red LED light as an excellent visual deterrent. In case your car lacks a security system, then this might be the steering wheel lock for you. Simply lock it in place and watch the steady light beep all night. The reason Master Lock has been gaining traction is because of the value that it delivers for the price. A quad hook lock, titanium build and an LED light, all give this product an exceptional value. Does not work with all cars. 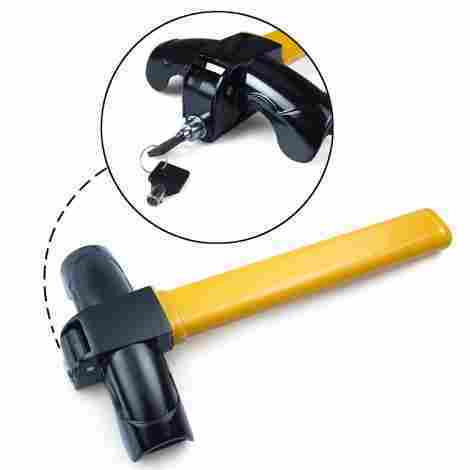 This product serves as both, an anti-theft device and safety hammer. It measures 19.2 x 5.1 x 1.3 inches and weighs about 3.7 lbs. The device comes with two styles of lock beams: round and diamond hexagonal. The performance is on par for both styles. The FREESOO also switches out plastic grips used my most wheel locks for foam to prevent scratching of the wheel and, the stickiness and smell that sometimes comes with plastic. This device is built with rounded steel and aluminum to resist prying, hack sawing, hammering and freon. It also features a T-shape hyperbolic lock cylinder that is designed for optimal strength and durability guaranteeing up to ten years of use. Besides adding strength, the hyperbolic lock cylinder also adds additional protection against lock picking. Besides being a visual deterrent, this product also serves as an emergency hammer that can be used to break a wind shield to escape, and, as a weapon for self-defense. The device also features an adjustable fork which can be changed to fit a car, van, and truck. The FRESOO has the same features as the Monojoy, but for its additional price it throws in a sturdy build as well as foam handles which will not scratch your steering wheels. Foam handle to keep from scratching your steering wheel. Suitable for cars, vans and SUV's. You need to manually stretch the lock to adjust it. The Eforcar does not boast a ton of features, instead it simply tries its best to provide a solution for a problem. 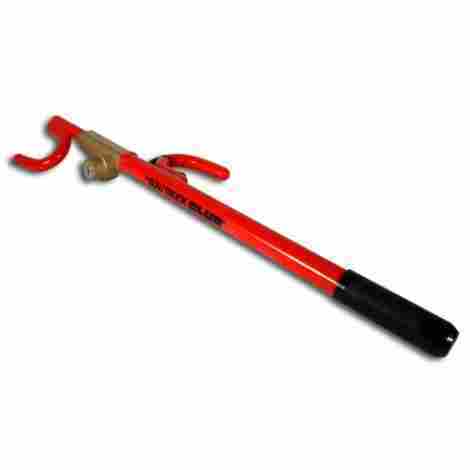 The basic build consists of a lock with a flat steel handle attached to it. As the lock clamps to the top (12 o clock) of your steering wheel, the steel handle rests on top of the dashboard and prevents any movement of the wheel. The purchase comes with 2 keys with unique designs that are impossible to duplicate. 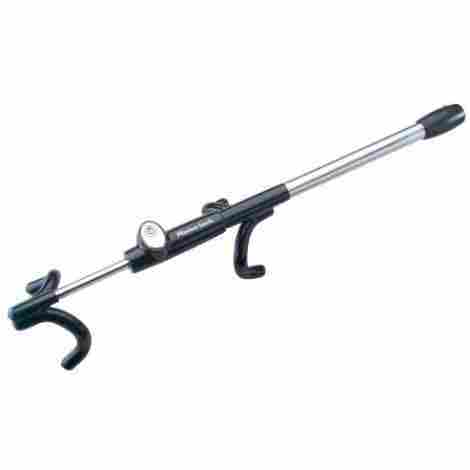 The Flattened Steel handle is probably the most prominent aspect of this product. While other locks opt for rods with hooks, Eforcar went with a flattened steel handle attached to a lockable clamp. 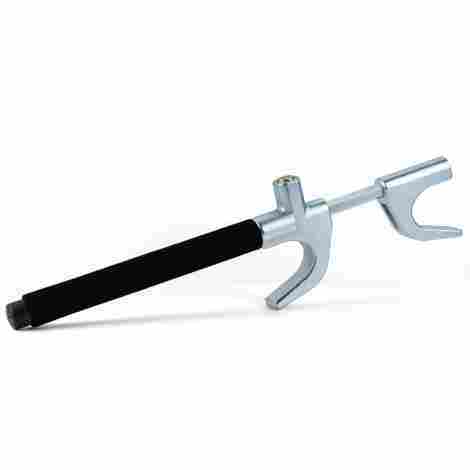 The advantage of the flat steel handle is that there is no ‘give’ when pressure is exerted. The handle just sits firmly on the dashboard of the car, plus the angle makes it hard to saw through. A great visual deterrent for an exceptional cost. The Enforcar sits snugly above your wheel and does not stink up the car with the smell of plastic, or, leave any stains on your wheel. Flattened Steel handle for security. Does not fit on thin steering wheels. That’s our list! We hope that this has been helpful in buying your next steering wheel lock. As a quick recap before you purchase, make sure you measure your wheel for diameter and thickness, determine your budget, keep in mind the visual deterrent factor and ensure the keys cannot be duplicated. Just because you do not have a car alarm or live in a neighborhood with a lot of car jackings does not mean you can’t protect yourself. There are always options out there, you just need to find the one that works for you. We hope we helped. Happy shopping and here’s hoping your car is always secure. The truth is that putting one of these devices on your car will not make it 100% theft proof. There are instances of car jackers breaking steering locks, however, cars with steering locks do have a smaller probability of being broken into. That is primarily because these products serve as a visual deterrent for most thieves. Police patrolling, citizen watches and watchful neighbors, make stealing a car an extremely time sensitive crime. Thieves want to make off with the car before anyone can get a good look at them or a patrol car rolls around. Stealing a car with a lock will take a lot longer than stealing one with out it, plain and simple. They will either have to somehow break it, pick the lock, or sit there sawing through it. It’s for this reason that most lock companies make their locks bright and visible. So that they serve as a deterrent for a thief before they even decide to break into your car. In fact, the Master Lock 263 DAT (no 8 on this list) went even further and installed an LED light which blinks when the device is locked. So, when you’re shopping for a lock, there is definite value in picking one that is easily visible from the outside—even at night. Build– The material that your wheel lock is made of is probably the most basic thing to look at. Most locks today are made of rounded steel, aluminum, or a combination of the two. These are sturdy materials. No one is going to be able to break your wheel lock, bend it, or freeze it using Freon. The strongest (and heaviest) material used in a wheel lock is titanium which is the primary material in the Master Lock 263DAT (no.8 on this list). Design-The design of the lock is just as important as its build. Some older locks go for a hook on the wheel and another on the brake pedal, some just hook onto the wheel while others sport quad-hooks, then there’s the Eforcar which clamps on the wheel and rests a flat steel handle on the dashboard. There are advantages to each design and what you pick will come down to what kind of car you have. If your car has a thick wheel then a quad-hook will clamp on nice and tight onto the wheel. You could also use the Enforcar over-the-dashboard security. Both these types of locks work great on thicker wheels. The hook on the wheel and brake is time tested and is the prime locking mechanism of the Club CL303. However, because it locks onto the brake clamp it is not noticeable outside the car and serves as a poor visual deterrent. Lock Features – You would think most locks are standard but that is not case. Each company tries to distinguish itself with various locking technology. Example, the DISKLOK (number 7 on this list) comes with a lock boasting ten internal discs with a million possible combinations. Any attempt at lock picking will cause the discs to spin making it almost impossible to pick the lock. Other companies boast complicated locking systems to stay competitive. Keys – What good is having a security device like this if your key can be duplicated? The key things to look at when buying a lock is words such as “Keys cannot be duplicated” or “Unique Cross key design” or “Laser cut”. Most options in this list come with their own security features on their keys. Here’s a quick recap: Eforcar (Cross key design), DISKLOK (unique keys that can only be cut by a specialist), Monojoy(laser cut keys), the Club 2100 (laser cut keys), and the Club LX (laser cut keys). These devices usually come with two or more keys, but a con is that if you lose the key then you may be in some trouble (which is why they usually come with two or more keys). One more thing, the companies that manufacture these products recommend not keeping the lock key with your car keys in case you lose your car keys. At some point, for most of us, the decision comes down to ‘price’. Sure, car security is important but so is a budget, or, maybe money is no option when it comes to protecting your prize automobile. Good news is that there are options—in terms of budget and security. Winner’s The Club has the most options for people on a budget who are tired of being targeted by car thieves. The Club is almost synonymous with steering wheel locks, so much that sometimes people mistake any double hooked lock for a Club. Club has managed to stay competitive by delivering value for money. They have higher priced options, but you will get as much value with a mid to lower priced Club. Bottom line, all Clubs are built to be visual deterrents for car thieves while also serving as a hassle for the more ambitious thieves. If you’re on a budget, you can also consider Monojoy, Master Lock and Enforcar—all these companies have their own benefits, and most are priced about as much as a mid-level Club. For anyone willing to spend a little more money on a lock, look no further than the DISKLOK. This product delivers for its price. Not only does it encase your entire wheel, it also protects your airbag, spins freely to immobilize your wheel and has a complicated locking system to protect against picking. There are plenty of options, at the end of the day it comes down to how much you want to spend. Some people buy one Disklok, while others buy three Club CL303(two for their cars and one for their boat). It all comes down to your personal preference. Q: What are the key factors to look at when buying these products? First thing is measure your wheel for both diameter and thickness of the wheel. After that, decide how much you would like to spend. There are different prices and you get more value with a higher price range; however, the lower priced ones are still effective. If price is not a restraint, decide if you want double hooks, quad hooks, wheel and brake clamp, wheel and dashboard clamp or to encase the entire wheel. Finally, ensure that the keys are unique and cannot be duplicated. The good news is that these devices are designed to fit most passenger automobiles including pick-up trucks and SUVs. The average outside diameter of a wheel is 14.5 inches and 17 inches. Most hook style locks have a range of 17 inches and will fit most passenger autos. The Club 2100 which is built specifically for larger vehicles has a range of up-to 19.5 inches. However, most companies list the range and dimensions of their product, so to be safe, measure your wheel before making a purchase. Q: Do they work left-hand drives? Most devices work globally on both left-hand and right-hand drives. However, you may not be able to use all the various security positions if you live in the UK and buy a lock from the US. Most wheel lock companies have a global presence and it’s always a safe bet to buy within the country you reside in. If you’re buying online then use the local website. Example: Amazon.co.uk for the UK as opposed to Amazon.com. Q: What do I do if I lose my keys? Wheel locks come with two or more keys. It’s always a good idea to keep one handy and another with family, friend, or in a secure spot. However, if you lose both keys then your best option is to call your insurance company for road side assistance, or, a tow truck. Some people have had success with hack sawing the wheel lock (time consuming), sawing off a part of the wheel to remove the lock (damaging to the car), calling a locksmith to open it (need a good one for the newer options). Since most keys for wheel locks cannot be duplicated, it’s a good idea to keep spare ones is a secure location in your house or with nearby family so you always have options in the unfortunate event that you lose your keys. Q: Do they really prevent theft? Yes and No. What you have to know is that thieves are always looking for easy targets and, usually, they target areas with a lot of parked cars to increase their odds of finding one. An accomplished thief will know his way around, however, even accomplished thieves will pass up a car with a security device for a car without one. It’s all about making your car a hassle to steal and these products do just that. The way around is to saw it off, saw off the wheel or picking the lock —all time-consuming acts which will discourage a thief. Even if you live in a safe town, it’s not a bad idea to keep a lock handy for when you go to a neighborhood or location where you are not totally comfortable parking your car. Q: What is The Club Theft Guarantee? Winner’s The Club gives all customers of its products a one year theft guarantee. Basically, if the car was stolen with The Club properly installed, then Winner’s will reimburse the customer up-to $2000 against the owner’s comprehensive insurance deductible. However, this is not valid in New York, Hawaii, Texas, or Wisconsin. Q: What is The Shield? The Shield is a product put out by Winners to be used along with The Club. One of the major ways car thieves get around these devices is by sawing off a part of the wheel to remove the wheel lock. The Shield protects against this attack and adds an additional layer of security. Purchase of this product is a personal choice and is not required for using any of the wheel locks mentioned in this list. Q: Will it stain my steering wheel? It totally depends on the material. Early options used to leave stains on your wheel when they were left in the car on hot days or for long periods of time. Modern products have tried combating this with the use of thin plastic sheaths around their clamps. However, customers do still find stains left behind on their wheels, especially if they live in hot climates. An easy way to get rid of these stains is with a clean cloth and rubbing alcohol. If you want to totally avoid the hassle of staining, then go with wheel locks that do not use plastic at all. Two on this list are the FRESOO(#10) which uses foam instead of plastic and EFORCAR (#9) which uses a clamp that latches onto the top of your wheel.